LOOKING FOR MODULAR OR PORTABLE? When you think of a portable exhibitor display, think 'pop-up' stands and lightweight booth options. These portable displays are great when traveling to different trade shows, and your space options are limited. 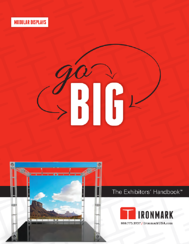 Pop-up or portable displays are a great and affordable option when planning your trade show or conference booth. Choose from options like banner stands, table top displays, tension and push-fit fabric displays, folding display panels and more! While modular displays are similar to portable displays in the big, bright impact they make, modular dispays are designed to be constructed or combined with other modules to create different shapes and sizes. They allow you to re-imagine your brand in multiple ways and fit different spaces. You can create different types of displays that fit together depending on the trade show or exhibit floor. Choose from modular banner systems, vector frame banner displays, outdoor displays, branded table throws, accents and accessories and more! Create, Produce, Install, De-Install, Delivery and more! When it comes to your exhibitor display, it has to be on point. Browse our handbooks and find just the right display, modular or portable. Our expert team, led by the formidable Bryan Gunning will begin from creation and take you all the way to delivery through de-install. 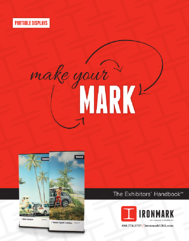 The Full Package for Exhibitors - including promo products, apparel, design services and more!